Hybrid is in these days. It's "green." It usually denotes something good, environmentally sound. 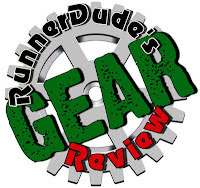 So, I was excited when Teva contacted me about testing and reviewing their new TevaSphere Trail Event shoe. I wasn't really sure what the shoe was about. I knew Teva more for their sandals and hiking shoes. From what I could tell It looked like a hybrid, an attempt to bridge the gap between the whole natural running movement and those that heel-strike. The slogan associated with the shoe was "Change Your Shoe, Not Your Stride." Well, that from the get-go, didn't really set too well with me. heel-to-toe profile often promotes a heel-strike. Teva evidently did a lot of research (4+ years), but it seems they did the research more from the prospective of proving their point than actually comparing their shoe to other types (square heel traditional shoes and minimalist). One point that sort of proves this is the data they report on weight of shoe verses stability. Their research shows the traditional square-heel running shoes as being heavy and borderline with stability. The minimalist shoe is shown as very light weight and providing the least stability. The TevaSphere is shown as a mid-weight shoe with the most stability. The rounded heel design, lower heel, and the exterior 3.5"-wide shock-absorbing pods located at the arch, are what Teva promotes as achieving this higher level of stability. The problem I have with these findings is was the testing done with the same foot landing for each shoe? My point is, if you're wearing a minimalist shoe and running with a heel-strike like you would most likely be doing with a traditional running shoe, then yeah, there would be very little stability because you'd be landing on your heel with no cushion and then your foot probably would roll inward, since there'd be no arch support. BUT....if you're wearing a minimalist shoe and have adapted the more natural running form of a midfoot or forefoot landing, then there is no (or very little) inward roll because you're not landing on your heel. You're landing flat on your feet or possibly on the balls of your feet. So, without knowing if each shoe type was tested in the modality in which it should be used, the Teva data on stability didn't really say much to me. I have the same qualm with their data on Braking v. Accelerating. One of the biggest reasons to adapt a midfoot or forefoot foot strike is that it eliminates the "Braking Effect." When you heel-strike your foot lands well ahead of your center of mass causing you to land heel-first. This means instead of working with the oncoming pavement, you work against it...hence the "braking effect." You actually stop for a millisecond then your body has to pull you forward before pushing off. Running should be more of a push than a pull. To achieve more pushing than pulling-then-pushing, you need to draw that foot landing in so it's taking place more under your center of mass. A midfoot or forefoot landing will do this. The braking effect not only is less efficient because it requires more muscle activation to pull you forward causing fatigue to set in quicker, it also increases your chances of injury. Hitting the oncoming pavement jars the ankles, knees, hips, and lower back. Over time this can cause injury. 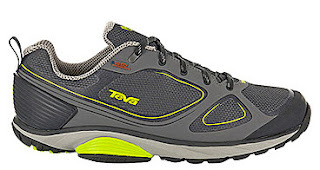 The TevaSphere Trail Event shoe is designed to lessen this braking effect with the use of a lower rounded heel. The rounded heel moves the point of impact closer to the center of the heel verses the back of the heel as in a traditional running shoe. My problem with this again comes with testing. The TevaSphere is shown with the best ratio of braking forces to accelerating forces in stride (.91:1.0). The traditional running shoe with the square heel is worse at (.94:1.0) and bare foot running is the worst at (1.0:1.0). They don't provide information in a minimalist shoe. Sure if you're running barefoot and the testing has the runner heel-striking as you'd be doing in the two shoe versions, then yeah, it's going to be worse. BUT.... if you're landing midfoot or forefoot when barefoot running (or wearing minimalist shoes) then there is no braking effect because you're working with the pavement. Teva lauds the TevaSphere as decreasing the amount of braking effect that occurs. Why not eliminate it altogether with a midfoot landing? You can do that in any type of shoe (even a traditional running shoe) if you focus on it. To me, it looks like a case of how can we stand out from the competition more than how can we best reduce injuries for runners. I really like the idea of having a shoe that appeals to the runner that enjoys experiencing different types of running--road, trail, obstacle races, mud runs, etc. I like that the shoe sits lower to the ground. But let's skip the bells and whistles of the rounded heel and exterior arch supports. "Change Your Shoe, Not Your Stride" to me means..."Buy Our Shoe and You'll Have to Keep Buying Our Shoe." Not sure that's in my best interest. Creating a multipurpose, water-resistant shoe, with a lower profile would have been great and could have been pitched as "One Shoe For All Your Runs." When I first received the shoe and wasn't quite sure if it was a walking shoe, hiking shoe, trail shoe or running shoe, I emailed my contact to see if I could get a better explanation. I never received one. I don't think I'm the only one who is a bit confused. In the recent issue of Outside magazine (Sept 2013), they included the TevaSphere in a review of Minimalist Shoes. According to Teva they're not minimalist. 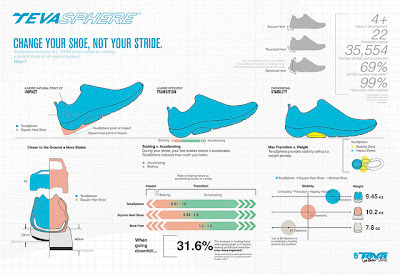 Outside magazine also says the shoe is best for "Changing Your Stride." Teva promotes the shoe as a way to run better without changing your stride. Outside goes further so say that the shoe "encourages hikers (or runners) to land midfoot, forcing a forward-leaning position." They go further to say that their testers either loved the "three-and-a-half-inch-wide, shock-absorbing pods on either side of the arch while on flat trails or they couldn't get used to how conspicuous they felt, especially on rocky, technical terrain. I think Outside got this right. They're better pitched as hiking shoes. "If you're serious about hiking more efficiently, the 'Spheres are like training wheels that remind you of your form. I am just one runner with one opinion. One runner's clunker shoe can very well be a godsend to another runner. But, at $140 a pop, I'd definitely find a store to test these in before ordering them or check the refund policy. I had the same issue. I was sent the shoe to test and couldn't figure it out what they were going for. I ran in them on the road a few times thinking I just needed to get used to the different style, but gave up when after an 8 mile trail run they still felt odd and more like a hiking shoe than a running shoe. So I took them on a hike and they actually felt great. Unsure what to think of them in the end, I ended up skipping the review. And like you, when I asked for more info, I was left in the dark. Enter to Win a GoPro HERO3 Silver Edition Camera!